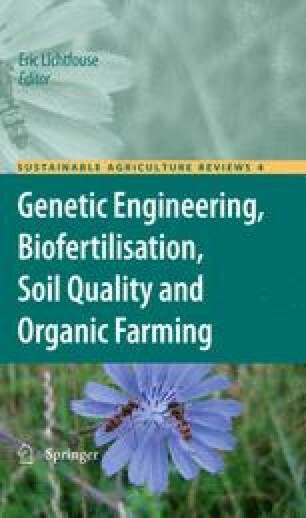 The urgency of the global food crisis, coupled with the environmental impact of global warming and fuel shortages, indicate that transgenic methods may be required to enhance food production and quality. Widely used chemical insecticides, such as phosphine and methyl bromide, are losing their utility either due to insect resistance or to the environmental damage they cause. It is most unlikely that traditional plant-breeding methods for generating insect resistance will deliver the crop improvements required in the available time frame. In this review, we discuss the application of transgenic avidin, a protein naturally occurring in egg-white, for the protection of rice, maize, potato and apple leaf from insect pests. Avidin binds the vitamin biotin with extraordinary affinity (10−15 M). Biotin is a water-soluble vitamin required for normal cellular metabolism and growth. The presence of avidin in the diet of insect pests is lethal since biotin is unavailable to them. The use of streptavidin, a bacterial homologue of avidin, is also described. We discuss the sub-cellular targeting of avidin expression in plants to avoid toxicity to the plant host and we describe the qualities of avidin which make it suitable for crop protection during cultivation and storage. Avidin is stable under normal conditions of crop storage but biodegradable and destroyed by cooking. These combined qualities make it an excellent choice for the protection of crops from insects. Finally, we discuss the modification of the avidin gene to allow expression in plants, the methods for transfection of the gene into plants, and the approaches used to quantify gene expression and avidin function in plant tissues. These methods include: polymerase chain reaction; enzyme-linked immmunosorbent assay; polyacrylamide gel-electrophoresis; fluorescence polarisation (FP); capillary electrophoresis; tissue-printing; square-wave voltammetry (SWV) and the measurement of larvae morbidity and mortality. Financial support from grants MSMT 6215712402 is highly acknowledged.